This Oil Services Giant Was Left Behind in 2016. Can It Rebound This Year? 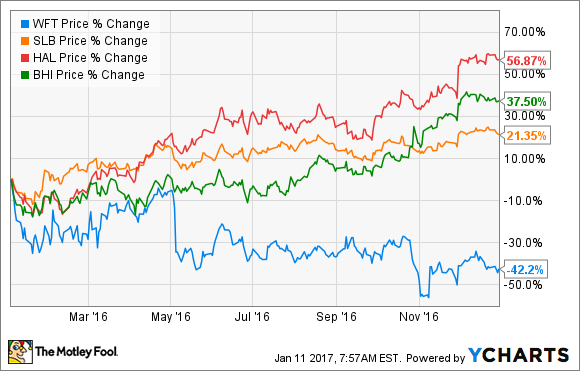 While the rest of Weatherford International's peers rocketed ahead in 2016, shares dropped more than 40% in 2016. For the past few years, Weatherford International (NYSE:WFT) has tried to rebuild itself as a more competitive oil services company through numerous restructurings and corporate moves. For investors, those moves haven't exactly panned out. There is no more telling sign of Weatherford's struggles than this past year as the company's stock took a beating in the market while the rest of the industry showed signs of life. Are Weatherford's struggles just a matter of timing that will correct itself in 2017, or are there deeper issues that are keeping this company from reaping the benefits of the oil and gas industry's recovery? Let's take a look at what happened at Weatherford this past year and what we can expect in 2017. These past few years have been tough ones for Weatherford. Even before the crash in oil prices, the company was struggling with low rates of return and an onerous debt load. Back in 2014, the company really started to address these issues seriously by drastically reducing its head count, selling off some business segments, and looking to get back to generating free cash flow to pay down debt. The plan looked great, but the timing was terrible, as it also coincided with the most recent oil market decline. During this decline, Weatherford has been trying to play catch-up to meet its cash flow and debt reduction goals. Between year-end 2014 and the most recent quarter, total headcount declined 43% and the business' support ratio -- employees in support functions such as administrative versus direct operations functions -- declined from 59% to 35%. According to management, this has cut a whopping $2.6 billion out of its cost structure. This sounds like the kind of drastic cuts needed to get a business turnaround going. Over that time frame, though, revenue at the business declined close to 59%, and that wiped out any chance of the company generating profits. The other problem this created was the fact that Weatherford's management has been put behind the eight ball in regards to its debt. Management's original plan was to generate about $150 million to $250 million in free cash flow in 2015 and another $600 million in 2016 to pay down some of its near-term debts. When that plan didn't pan out, the company was forced to refinance much of that debt at even higher rates than before. Image source: Weatherford International investor presentation. One of the biggest reasons why Weatherford's stock declined as much as it did was from disappointing quarterly results. This was most prominent in the first and third quarters of the year, as the company wildly missed GAAP earnings per share expectations. A lot of those big misses were due to large asset writedowns and impairments. This was especially concerning because management had said in 2015 that -- after several billions in writedowns in prior years -- it didn't foresee any further impairments or one-time charges. If those weren't enough problems to deal with, Weatherford also announced a big scare on Nov. 1 when it said that it was coming precariously close to its debt covenants. With all of that newly issued debt out there, the last thing investors or creditors want to hear is that the company is already at risk of not paying them back. All of this led to the resignation of founder and CEO Dr. Bernard Duroc-Danner. In November, it was announced that he would be stepping down from the role of CEO and chairman. Duroc-Danner was replaced with the company's CFO Krishna Shivram as CEO and Vice Chairman Robert Rayne took the executive chairman spot. If the rest of the industry was struggling as much as Weatherford was, then perhaps this wouldn't be as much of a story. However, 2016 proved to be a pivotal year for the business as we have started to see drilling activity pick back up again in the United States. Also, several companies in this industry have made moves to make them more competitive in this lower-price environment. First, we had Schlumberger (NYSE:SLB) complete its acquisition of Cameron International. The we saw General Electric's (NYSE:GE) oil and gas business segment look to combine forces with Baker Hughes (NYSE:BHI). These two moves will give each business a leg up over its competitors as it integrates both equipment and services, something that has the potential to save the industry billions through simpler procurement procedures and more standardized equipment. As a result, we saw Weatherford's stock plummet while its peers posted double-digit gains. Can it recover in 2017? With a new CEO in place and a much smaller labor force, the company does actually look like it is in a better position to succeed in this coming year. Companies are starting to open their wallets again to spend on new projects, and some of that will flow to Weatherford. The company's much lower cost structure should translate any modest uptick in revenue into operational profits, and hopefully put it on the track of generating free cash flow that has eluded management for years. From an investor's standpoint, though, this may not be the stock worth pursuing. Weatherford's stock is down 78% from when the oil market crash started to take root, so any marginal gains in revenue and operational profit will likely lead to much higher stock prices. However, the company's long-term prospects are much more uncertain with that large debt load. Furthermore, most of its peers look to be in a much better position to capture the gains in the market with their better offerings. If you are looking for a long-term investment in this industry, then Weatherford is probably the last of the oil services stocks you want to look at.